Summer Skipper´s Essentials: Sailing Cap, Sailing Gloves & Sun Protection. Who is not familiar with that displeasing sensation: Sunburn! Your skin is peeling, the whole face is aching and virtually nothing will help to cure the pain. No crème, no after-sun lotion. No nothing. Taking a shower turns torture, friends will probably get mad about your flippancy, strangers will stare at your face, shaking their heads. Sunburn is a real problem. This article is due to recommend three absolute essentials a sailor shouldn´t forget to take with him onboard. Though it´s logical to have a thorough sun protection applied in summer as well as wearing some kind of hat plus protecting one´s hands with proper sailing gloves, you won´t believe how many skippers just forget to take these commodities with them or simply forget to have them applied in the midst of the stressful maneuver-planning. I did so as well during my RYA Coastal Skipper education cruise which took me out on the seas for 6 consecutive days. A painful learning lesson. A proper sun protection is a must. Period. 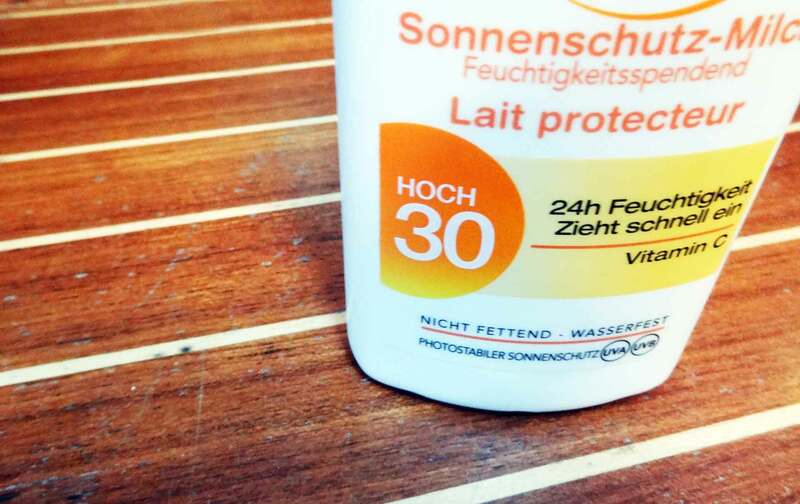 You should apply sunscreen with a minimum filter of factor 30, though a 50 would be better. Depending on the browning status of your skin, really pale white guys – like myself – should opt for the highest sunscreen filters available. Additionally, the application of thick sun-blocker (or an impenetrable layer of Nivea) on your nose and lips will be best to help these little body parts be protected. Have a thorough eye on creaming your neck and ears as they are easily forgotten (and normally burnt first). Attention: To re-apply sunscreen from time to time does not prolong the duration of protection. You should expose yourself as less as possible to direct sunlight – even when sojourning in the shadows, UV-rays can easily reach you. You love to go swimming? Me too. But be aware that UV-rays aren´t filtered through the water, it´s even worse. UV-rays are refracted and bundled and can be amplified to a depth of 1 meter. No matter which weather you´d expect – well, except in really cold temperatures – a proper sailing cap is more than a fashion statement and part of a sailor´s traditional “uniform”. It´s a real hit. 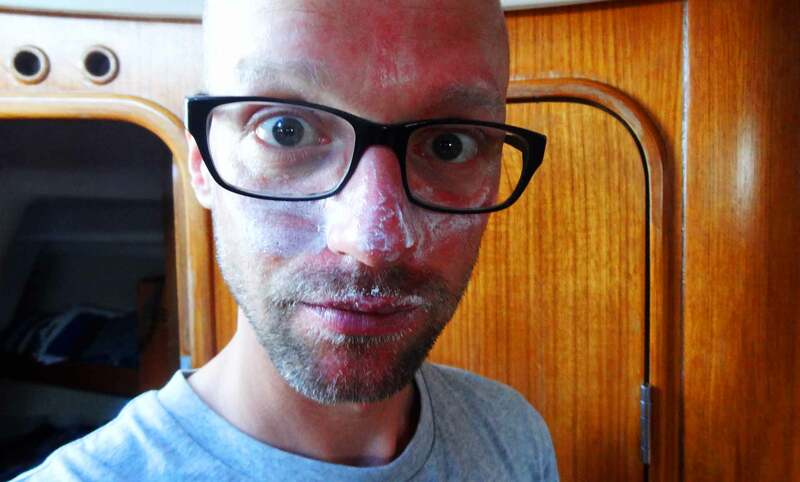 I had to experience it first hand: During my yachtmaster-examination trip I got my whole scalp burnt to the bare skin. After two days I had large, very large, scurf pealing from my head, washing or taking a shower was sheer horror. Additionally, we were sailing in 4 to 5 bft winds with gusty conditions and that meant it got cold from time to time, but it was way too hot for my woolen hat. Again, even wearing sunglasses, especially when sun was high up in the sky around noon, it couldn´t filter her beamy lights blinding me from time to time when checking the Windex up there. Simply: Annoying & dangerous. An ordinary base-cap is a solution: It has a solid, kind of hard peak, protecting the eyes even when the sun is high up at noon nonetheless guaranteeing a good panorama view. 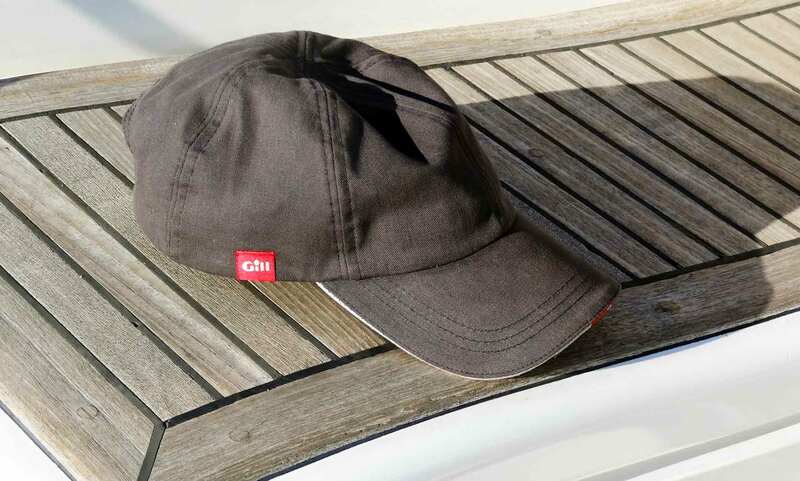 A strap at the back will make the cap adjustable to any size of anyone´s head. It will stay secured on your head even when wind is blowing hard. 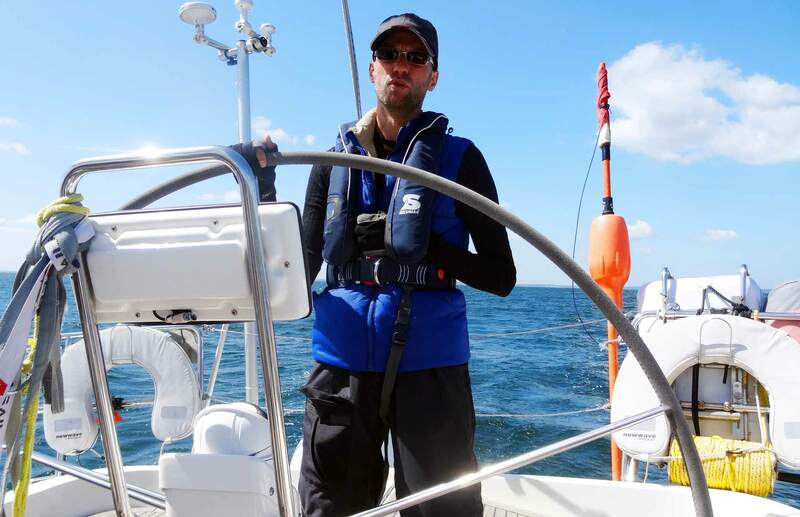 Most of the major sailing clothing manufacturers offer special sailor´s caps, such as mine made by Gill, which I opted for because I hate wearing Caps of Baseball-Teams (I´m not 16 anymore). It´s a rewarding acquisition: My Gill-cap is worth 20 Euros but it virtually saved my scalp. Tune your cap: On the internet you may buy inlays made of plastic which will act as protection against hard knock – booms for example. My hint: Don´t forget to spend extra 3 Euros or so for a securing strap that will keep your precious cap attached to the collar of your sailing jacket in hard gusts. No matter if it is hoisting the sails, working the sheets or pulling close the main: Working with the ropes is wearing out the skin of your hands. Pro-skippers do have a thick natural grown cornea over time, lubbers like me don´t. 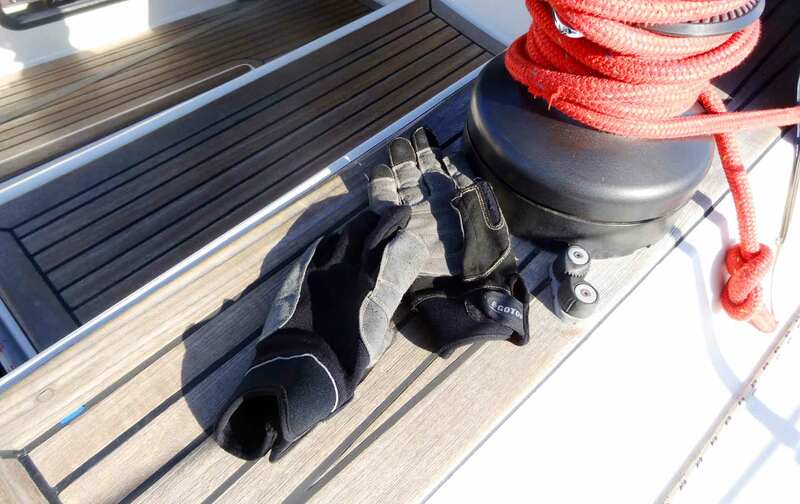 So, if you are a spare time skipper you should protect the inner surfaces of your hand´s skin – did you ever experienced this burning sensation when a mainsheet is dashing out though your hands? Better wear gloves! There are so many and I opted to buying two sets of gloves: One set is made from neoprene. I use them in cold and wet conditions. They will keep me dry and warm. The other set, which I applied during my RYA Coastal Skipper cruise, is thin. Thumb and trigger finger´s tips are uncovered to be able to work touchscreens or do difficult work such as unscrew a shackle or something. No matter which gloves you wear, it´s major feature should be a sturdy surface on the palm of the hand. Thick leather will do best. So, these are the three essentials for summer sailors – never again casting off without! What are your experiences with sun protection, hats and other sailing gear like gloves and stuff? Looking forward to your hints and tips, just drop a comment. Previous Post	Sailing Training for the Yachtmaster Coastal Skipper. Part 1.